The Archbishop of Canterbury has urged Christmas shoppers to give money to Britain's expanding network of food banks rather than splash out on expensive presents. The Most Reverend Justin Welby made the appeal in reaction to news of a shocking increase in the number of impoverished Britons now relying on food handouts. With the number of those receiving basic supplies trebling over the past year to 350,000, he said it would be 'wonderful' if people gave a tenth of their festive shopping budget to their local food bank this Christmas. The Archbishop also warned cash-strapped shoppers to beware of overspending and plunging themselves into debt. He said: 'I am not a Scrooge. But what I would say to people is, be sane about it. 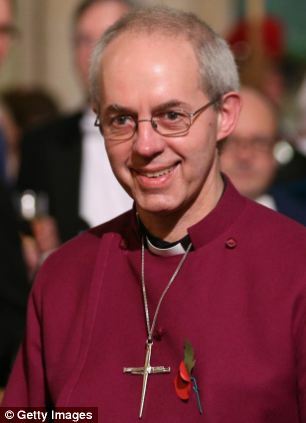 Archbishop Welby's warning comes as it was revealed that Britons will spend an average of £28.70 on each present this Christmas - an increase of £1.70 on the figure for 2012. And a YouGov survey reported earlier this week that UK households are set to spend £822 on their seasonal celebrations - £54 more than last year. The comments are the latest in a string of outspoken pronouncements made by Archbishop Welby in recent months. And in an interview with The Mail on Sunday last month, he hit out at energy firms for imposing huge price hikes on struggling families. Another target of Archbishop Welby's criticism recently has been the controversial payday loan firms. He said it was his dream to 'compete' Wonga out of existence through the growth of credit unions offering much lower lending rates. The Archbishop's focus on food banks chimes with political concerns about rising levels of food poverty. In October, a cross-party group of politicians was set up to investigate the surge in demand that has led to the creation of about 400 food banks across the UK. And the Red Cross has also announced that it will start collecting and distributing food to the needy in Britain for the first time since the Second World War. But there has been scepticism from some about the need for such handouts, with Education Secretary Michael Gove claiming in September that those who find themselves without enough money for food are 'not best able' to manage their finances.